Talk about your background and how you gravitated to filmmaking. I grew up in New York. I’m the daughter of a commercial producer. My dad did high-end commercials and I got to watch [directors] Ridley and Tony Scott and see the differences between them and how they worked. It took the magic out of it, which is great. Then, I had a cold hard eye for all of it. How’d you end up filming in Ohio? Ohio is not overshot yet. It’s fresh. It’s incredible. It’s varied. It’s reasonable. I got gorgeous, gorgeous stuff and because of the train accident in the movie — I don’t want to spoil it, though the trailer did that already — we couldn’t use an STX train [from the production company], and we had to do it carefully and the prep and planning for that was a year in the making. We had support from Cleveland and Independence, where we did it. There were police officers that helped us and we really, really had a production-friendly experience, which is unusual. How’d you come across the script for the movie? There was another draft that didn’t go anywhere. That draft came to my husband and I, who are writing partners. We saw a different way in. We went back to the source material and felt out what wasn’t realized. We took the source material and did our own version of it. I supervised him and he wrote it as a sole credit so we could split the credits. I’m the director, and he’s the screenwriter. Were you familiar with the book? Yes. It’s an interesting story. They say it’s based on real events, but we went into a different direction. It’s set in Wisconsin. These three graduate students, sure enough, did summon the Bye Bye Man and he ruined their lives. That’s the chapter in the book. It’s set near this factory on the river and whenever there was an accident, the dead bodies would float down the river. These three young people will not talk about what happened to them, even today. It’s an interesting, creepy thing that happened and we used that. There are so many horror movies about the boogie man. What did you try to do differently? I don’t think there aren’t a lot of boogie men who aren’t in one person’s head. The Candyman is the most similar. Freddy, Jason and Mike Myers work very differently from the Bye Bye Man. They are psychopathic machines with unusual nasty weapons. I was attracted to this because it’s psychological and trippy and intense. When he gets in your head, you can’t get him out. It’s like a virus. It’s like a pink elephant. When I say “pink elephant” to you, you’ll think about pink elephant all day. He makes you see things that aren’t there. He preys on your weaknesses. How are you made up? Are you a jealous or angry or needy person? He plays on that stuff. You see things that aren’t there and then you do terrible things. It’s very intense in that way. I wanted to do these psychological set pieces that are very real. I didn’t shoot them with special filters. I made sure they looked real. That’s why it’s upsetting. You have a great young cast. Talk about what they bring to the movie. The three leads are Douglas Smith, who is really excellent. You may know him from that Bill Paxton show that was on HBO [Big Love]. He was on it as a kid. Cressida Bonas is more famous as Prince Harry’s girlfriend, but she’s now starring in the West End version of The Great Gatsby, and she’s amazing in the movie. Lucien Laviscount people know from Scream Queens and he’s great. There’s also Jenna Kanell, who I loved. I had three old pros in Carrie-Anne Moss, who plays a detective who knows there’s more going on and she’s excellent, and Faye Dunaway and Doug Jones, who played the title character. He’s excellent. Was it difficult to cast? Our casting director is very special and gives us ideas. She’s not bewildered by rejections. There’s always one part that’s hard to cast. That was Jenna Kanell’s part as Kim. She’s funny and charming and gets emotional. I got people who were good dramatically but weren’t funny. I got comedians who were funny and bouncy but couldn’t do the dark stuff. Jenna was able to do both. Have you thought about your next movie yet? Yes, I’m working with the people who did this movie and we’re working on a creature feature which focuses on ants, bees and wasps. It’s very scary. I’m coming for you again. I’m up for a couple of jobs. I’m up for a job at Fox which will be a big deal but I can’t talk about it. There’s not a lot of women directing genre. It would be great to get parity for women. A lot of us are experienced but don’t get the opportunities. As a kid, I always craved the scary stuff. I had a very nice childhood with lovely parents who are still married and I don’t have a mental illness. I had a couple of friends die and that brought a darkness to my psyche. I craved scary movies and I used to ride my Schwinn with the fringes on the handles and the little bell and would talk people into buying me tickets to R movies. I saw this movie in 1979 called The Silent Scream and it scared the piss out of me. Barbara Steele played Victoria. My friend and I went to the IHOP after and I drank a whole pot of coffee. When I got home, it was like I was on speed. I finally fell asleep only to wake up at 3 a.m. with Victoria in my room staring at me. I ran upstairs to my parents’ room and woke them up. My father was pissed. He asked me what drugs I was on and after that intensity I craved it again. It’s not about going fast — there’s something more about getting scared that keeps me alive and makes me happy. Stephen King says horror films work because they’re like feeding meat to the alligators. They keep the perverse tendencies at bay. He’s a genius. So many of his stories have been made into the best horror films, even if he doesn’t like how they came out. You think about what Kubrick has done. He has a great moral center of good and bad. You watch a film based on his work or read something of his and you know who you’re supposed to root for and who you’re not. There’s not a lot of ambiguity, which I think works in horror. He’s really brilliant. I always talk about him because I worked on a piece of his called Dolan’s Cadillac and lately I’ve been working on another piece of his called Duma Key, which hasn’t been made yet. I find his stories so compete and realized. 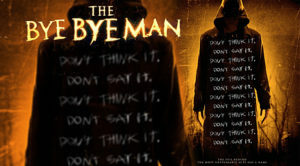 I looked at that a lot for The Bye Bye Man. We don’t want to have complexity in our heroes. We want them to be people we’re rooting for because we want them to beat the Bye Bye Man. They talk about themes like faith and class and all these things. The world is a scary place. You put your kids out there into it and what are they going to do? 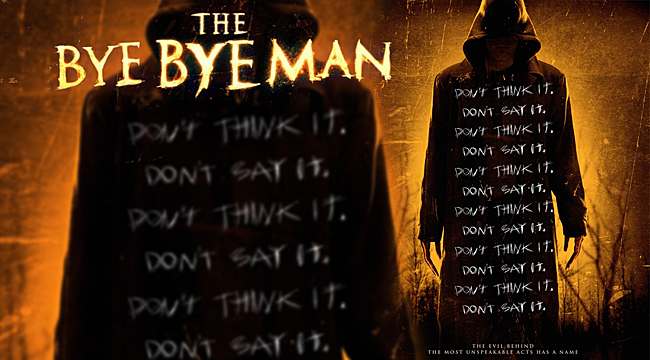 They’ll find things that are really overwhelming and that they’re ill-equipped to deal with and that’s what the Bye Bye Man is about.